“Faith has a public relations problem,” is what I wrote (with my co-author and friend, Klaus Issler) in the preface of this book. Simply put, “faith” has been reduced to being not much more than a feeling (e.g., being inspired) or a blind act of will (e.g., “a leap down a dark alley”); it is frequently detached from knowledge. That problem is a burden that motivated Klaus and me to help Christians (and any on-looking non-Christians) to think deeply about the rich meaning of biblical faith, especially as that faith is witnessed in the contemporary world. What our 2006 book, The Lost Virtue of Happiness, tries to do for the concept of “happiness” so our In Search of a Confident Faith attempts to do for the concept of “biblical faith”; namely, our endeavor is to excavate and recover a lost vision and an appropriation of a way of thinking and living. In short, the biblical meaning of faith is confidence in God, or as we say, “God-confidence.” That meaning of faith is rooted in knowledge of what is real. But when faith is detached from knowledge, whether in speech or practice, it sends a signal to our own Christian communities or our non-Christian communities that faith is simply a private, individual, religious matter. But the biblical idea of faith is far more enriching and whole-life encompassing; it is the very way that we are meant to be in the world, indeed in our Father’s world. Thus, our book is divided into two basic parts: In the first part, we address what faith is and what it isn’t (chapter 1) and what are some of the challenges to faith in our mind (“doubts”) and in our heart (“distractions of the heart”), which we develop in chapters 2 and 3. A major way we grow in God-confidence is by knowing that we know something is true. Thus, training (formally or informally) in Christian apologetics can be an effectual spiritual discipline for learning how to grow your confidence in God because you can get good at knowing why you believe what you believe. Now, intellectual doubts are real and they must be addressed from the advantage point of knowledge. For just like fear, doubt is best addressed not from the standpoint of ignorance of but from the strength of knowledge and wisdom. This is one among many reasons why our faith must be environed in knowledge. In chapter 2, I offer specific steps to address our intellectual doubts. In chapter 3, Klaus addresses the distractions of the heart, specifically, emotional and relational doubts that fester in our interior. In part two, Klaus and I talk about how to grow God-confidence from within our ordinary life. For example, Klaus’ chapter 4 presents a helpful, biblically-informed vision of answered prayer and how such a discipline transforms the very plausibility structures of our worldview (what we are open to believe or consider being true). 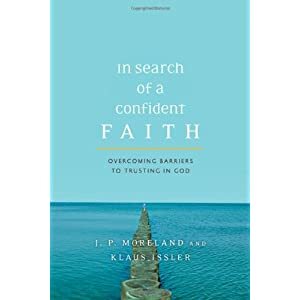 Furthermore, Klaus shows how and why are lives are meant to be lived in and by God-confidence and not by sight, which Scripture teaches and Jesus lived and modeled for us. Bearing witness to what God has done or what he is doing naturally flows from God-confidence (chapter 5). Why? Because to witness, as Dallas Willard has often said, is to help people come to know something. And since God-confidence is rooted in knowledge of what’s real – in this case, knowledge of God’s activity in His world – how could we not witness if we have God-confidence. This is not meant to guilt people into doing something. Rather, we must straightforwardly deal with any inhibiting factors that affect the deepening of our faith and learn to practice bearing witness to God’s activity in our lives, which will flourish our God-confidence for the sake of others. Perhaps the most relevant way to grow God-confidence from within the soil of the ordinariness of our lives is to learn how to trust in God for guidance about life’s decisions (chapter 6). Klaus helpfully shows that a part of what this significantly means is that we learn how to live within the range of what pleases God. There is tremendous freedom to maneuver in God. But it is, as some may say, an ordered freedom. The goal is to learn to detect, with discernment from the Spirit, how God wants to guide our life, whether through meditation on Scripture, through the wise counsel and advice of others (especially from the shared-life of our Christian communities), and through the witness of the Spirit within. It invites you to experience growth in God-confidence by virtue of the understanding that you’ll gain and through the inspiring stories that are told of God’s activity in His world. It helpfully and strategically makes sense of intellectual and emotional/affective doubts. It usefully locates the growth of God-confidence within the broader context of worldview formation. Its tone is pastoral and wise, biblically-informed in its instruction, and experientially trustworthy and testable. It offers intentional application questions at the end of each chapter, which are useful for personal and group consideration.